It is both an honour and humbling to write this foreword. As an Indigenous woman and a teacher, I am a committed believer in preparing new generations of transformational leaders in the political, social, and science sectors. Hence, I am always in search of good resources to use at our First Nations College. Dr. Snow’s oral literary research is important in aligning and promoting Indigenous grassroots history and knowledge for use in places of higher learning. For too long we have relied on western interpretations of our history. These Mountains are Our Sacred Places identifies who we are and impacts on prospective students by validating their contexts and authentically transforming the past into the present. For students questioning their place in modernity, Dr. Snow’s book is a gentle reminder that our spiritual lands, our Mother Earth, beckons and embraces all. In his writing and teaching, Dr. Snow works humbly within an Indigenous paradigm. He shoulders the responsibility of interpreting the oral teachings, and this takes great skill and knowledge of self. As an intermediary, he eloquently interprets the elders’ knowledge, thus positioning it in time and honouring the traditioinal way of passing knowledge. He poignantly captures in print the time-honoured ways of servant leadership and situational leadership, traditioinal organizational structures and prespectives on relationships (including our human responsibility to each other and our relationship with the land, elements, and the cosmos). These Mountains Are Our Sacred Places acknowledges our interdependence and the holistic nature of the world. The book highlights the structures that work for First Nations peoples, including decision making through consensus and equal voice rather than through power, authority, and control, which are elements of linear thinking. I continue to honour and encourage people to walk the path forged by trailblazers such as Dr. John Snow. These Mountains Are Our Sacred Places gives me hope that we can make effective changes within our spheres by drawing on the foundations left for us by our ancestors. Like a warrior of old, Dr. Snow deftly secures this knowledge to share with the world. 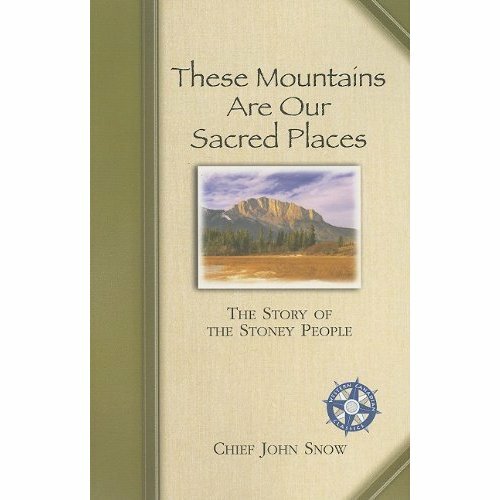 These Mountains Are Our Sacred Places is available from Fitzhenry and Whiteside Limited, Publishers as well as on Amazon.com.